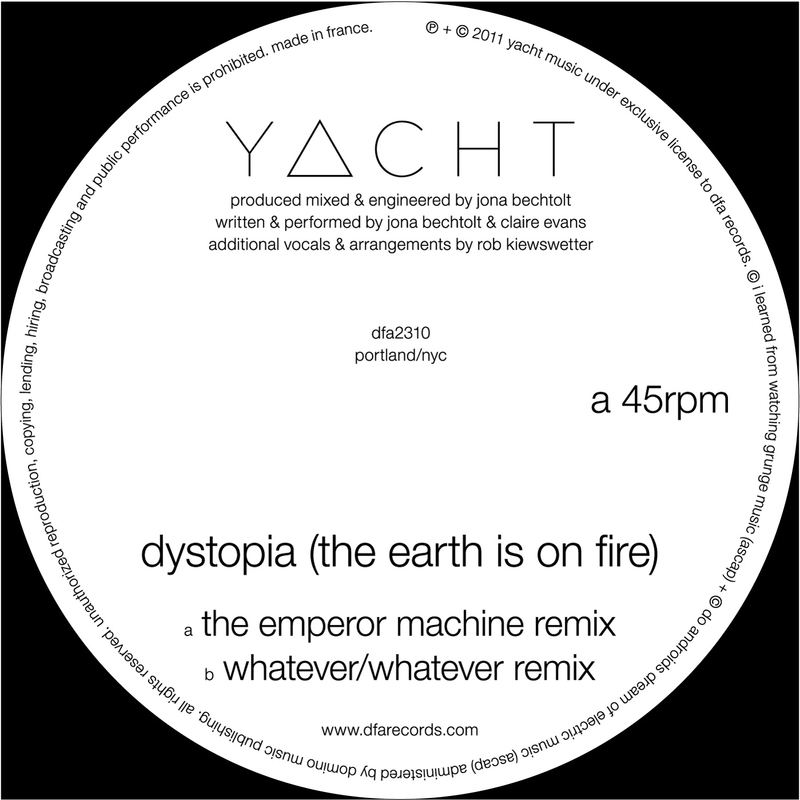 While YACHT refers to "Dystopia (The Earth is on Fire)" as a “post-apocalyptic fight song” and a “cautionary tale,” the track's chant-along melodies and unsparing synths nudge listeners far closer to dance than despair. From the sound of things, that reaction will likely also be elicited by two new remixes of the Portland duo’s song, from their 2011 long player Shangri-La. Legendary production duo Justin Strauss and Bryan Mette, aka Whatever/Whatever, completely rework the sound of "Dystopia" on their version, reorienting it with heavy doses of funk. While the original rides atop buzzing synths, the Whatever/Whatever remix adds a thick bassline and shimmery keyboards that leap out like solar flares. 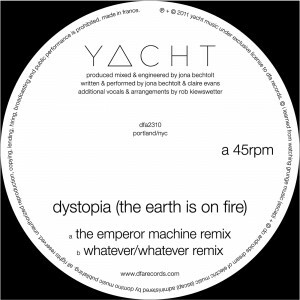 On the flipside, UK-based Emperor Machine starts their Dystopia remix with a dubby feel – every vocal echoing endlessly – and then U-turns into wholly a updated, yet classic, disco sound. The rhythms are sultry, slinking behind a deep, repeated, synthline; it’s a recipe for an unexpectedly smooth, subtly hypnotic, and utterly danceworthy song.